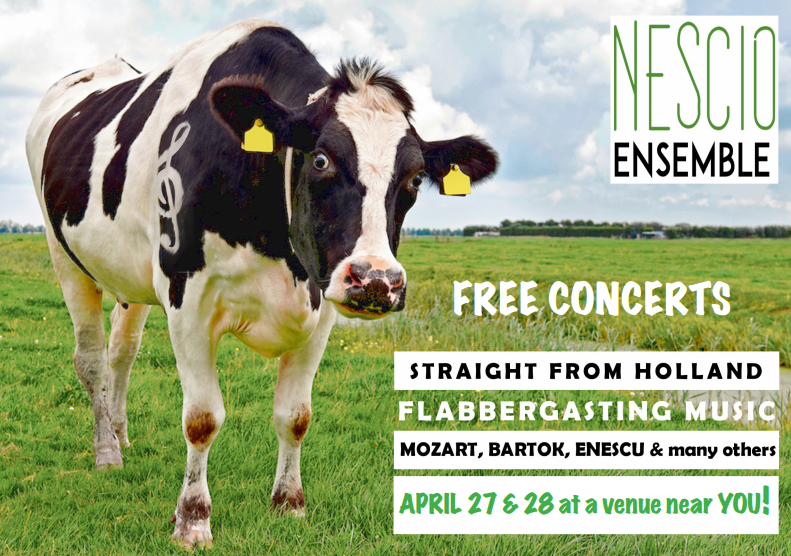 NESCIO ENSEMBLE from Holland is a young, passionate string orchestra made up of friends brought together by their love of music. Their enthusiasm is contagious and has brought them close to their audiences everywhere. Their concerts and tours are self-organised and not for proft. Playing in the ensemble gives the musicians the chance to play repertoire that they love, together with their friends. Among the pieces they will perform in these concerts are movements from Mozart’s well-loved Quintet KV515, the fantastic Enescu Octet and Mendelssohn’s violin concerto. See attached for more info ! As you will have seen from the 2017 programme the theme for this year’s supper is Hungarian food and this will take the form of a ‘bring and share’ supper at the Forman Hall on Saturday 4th March at 7.30 p.m. As some members may not be familiar with Hungarian food we have drawn up a list of dishes for the evening which is shown below. All the recipes can be found below. We would like everyone to bring one dish per couple the quantities required are shown below. Please either download or print the relevant recipes and let me know as soon as possible which dishes you are preparing as once they are allocated the recipes will be removed from the website to avoid duplication. The aim of the evening is to have a wide variety of dishes for us all to try. We begin the year, as always, with the themed supper which will be held on Saturday 4th March at the Forman Hall. As usual it will be a bring and share evening. Although we are not organising a GF outing to Potato Day it will be held at the Kelso Showground on Sunday 5th March. If you wish to buy your seed potatoes, then this is the place to go. The much loved and well attended Safari Supper will be held on Saturday 3rd June. As usual we shall be visiting the gardens of three members to enjoy a guided tour and one course before moving on. Progress continues to be made behind the scenes on our long march to Superfast Broadband. BT still say they are “planning” to bring superfast broadband to the Borthwickbrae exchange in the last half of 2017. Don’t hold your breath on that one, but we live in hope ! Our best option, in my opinion, is the joint approach that is being undertaken by “Borders Broadband” (formerly Ettrick and Beyond….). Since the last newsletter article, a great deal of work has been done behind the scenes. A Project Board is now in place, a website developed and a number of avenues to bring Superfast Broadband to the areas involved are being investigated. No change on the BT front with BT saying they are planning to bring Superfast Broadband to the Borthwickbrae Exchange between July and December 2017. In response to the Ettrick and Beyond State Aid Public Consultation, BT didn’t object to state aid being given to areas covered by the Ettrick and Beyond project, which is a little confusing as if they were planning to bring Superfast Broadband, would they not want to rule out any competition ?! A mixed message !? "A confusing situation" is probably the best description of where we are at the moment. BT/OpenReach (on the Scotland Superfast website (https://www.scotlandsuperfast.com/where-when/) say some of the valley should get Superfast broadband between July 2017 and December 2017. This is a delay of 6 months on what they were saying a couple of weeks ago. Great, but disappointing that it has been delayed !! The Gardener's Forum are once again organising the harvest supper which will be held in the Forman Hall on Sunday 2nd October at 7.00 p.m. following the Harvest Thanksgiving in the Kirk at 6.00 p.m. The menu will consist of Chicken and Mushroom Pie served with vegetables followed by Toffee Pudding with Toffee Sauce. There will be a vegetarian option, please specify this when booking. The cost will be £6 per head. As usual please bring your own drink as we shall only be providing water. The harvest supper is a lively and informal evening and you will be made very welcome. If you would like to attend, please contact Judith Hutchinson on 01450 880653 or judith@bitstone.co.uk by the 23rd September. Scotland names next batch of Fibre broadband Upgrades - It's not us ! The only Scottish Borders upgrade is "Camptown"
Read more about Scotland names next batch of Fibre broadband Upgrades - It's not us ! Good News on the Valley Broadband situation for most ! The good news comes from a few directions. This is the most likely route to SuperFast Broadband for the majority of Valley residents. BT has given us a date for when most (BUT SADLY NOT ALL) will receive SuperFast broadband from BT. The working group have drawn up a list of events for 2016. At our recent meeting Colin Plumbe stood down both as chairman and a member of the working group. Colin was the driving force behind the setting up of the Gardener's Forum in 2009 and as a result of his hard work it has been a great success and continues to attract new members. We shall miss his contribution. Sandra Knox has also retired from the working group. Again, we shall miss Sandra who has been generous with her (very limited) time in support of the GF working group. Both Colin and Sandra remain members of the GF. I have agreed to take over the administration of the GF, Tom Hutchinson will chair the meetings and the working group will share the organisation of the events between them.